With the increasing popularity of power efficient computers, incessant inovations have been surging to replace the old. 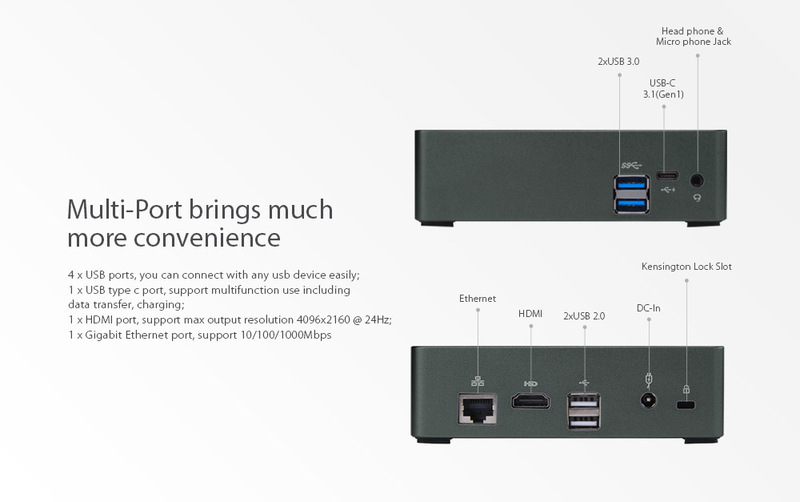 The majority of barebone mini pc are pretty much not fully equipped and you need to fill it to get a ready-to-use PC. 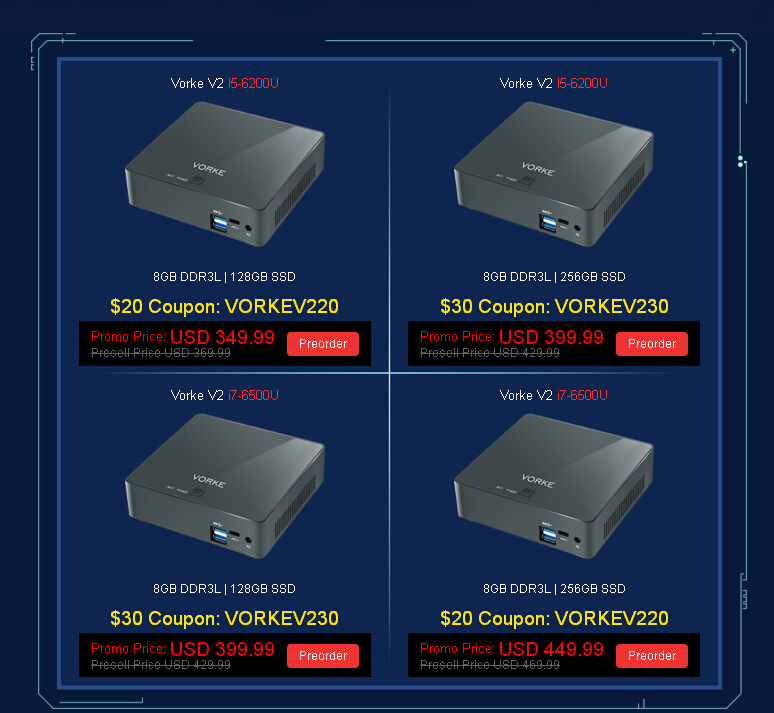 This is not the case with Vorke V2, since the specs on this compact pc has ratcheted up. 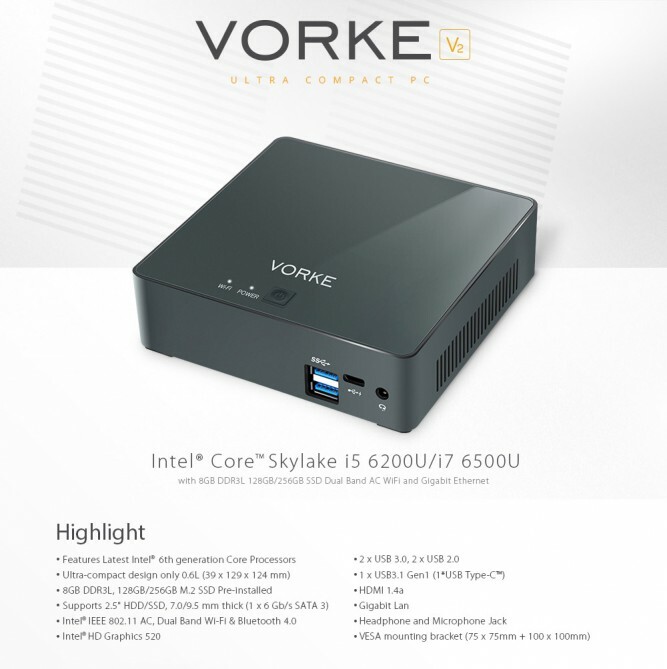 As the successor of Vorke V1, VORKE V2 is a Skylake pre-loaded ultra compact PC with Ubuntu16.04, powered by an Intel I5-6200U or I7-6500U dual core with 8GB RAM, 128 or 256GB internal storage, and two important features if you want to use it as a desktop PC or full-fledged working station : support for internal 2.5 inches hard drive, and display support via HDMI. At the first glance, the front panel exposes two USB 3.0 ports, 1 USB-C port, a MIC/Line out jack for voice output, while the rear panel features USB 2.0 ports, a kensington Lock Slot, a HDMI port, RJ45, and a DC jack for power supply. Ventilation holes are neatly placed at both sides for heat dissipation. 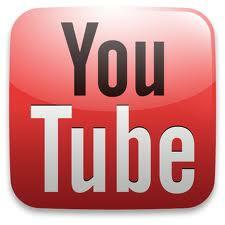 Its compact body sized 129 x 124 x 39, with VESA mounting bracket included. 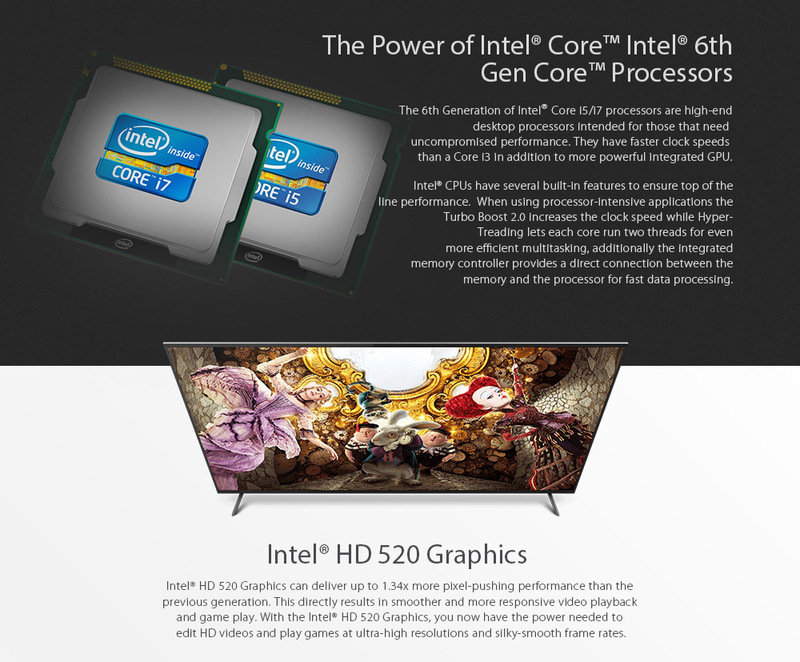 Speaking of the 6th Gen Skylake processors, either i5-6200U or the more powerful I7-6500U, both are Intel HD Graphics 520 packed ULV models with excellent performance both in cooling and noise ratio. Besides, the communication connectivity ranks high with the gigabit Ethernet, AC Wi-Fi and all the aforementioned interfaces. There are 4 models released officialy on Geekbuying site, 2 with I5-6200U, the other 2 I7-6500U, each carrying 128 or 256 GB SSD in M.2 slot respectively, optional 2.5 in SATA 3 HDD bay available. 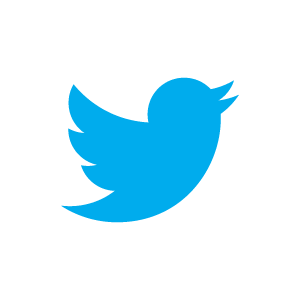 If it is for you, just go ahead to to snap up a $20 or $30 coupon at Geekbuying.